MAST@FIU recognized as one of top high schools for STEM education in the U.S.
MAST@FIU Principal Matthew Welker, pictured second from left, back row, and several teachers join Florida Education Technology Conference staff in accepting the 2015 STEM Excellence Award. Less than two years after its grand opening, MAST@FIU, the only four-year high school on a university campus in Miami-Dade County, has been rated one of the top high schools in the nation for STEM (Science, Technology, Engineering and Math) education. The school was selected from hundreds of high schools around the U.S. to receive the first-ever 2015 STEM Excellence Award, which recognizes innovation in the field of STEM education at the elementary, middle and high school levels. Applicants were evaluated on their use of interdisciplinary curriculum, collaboration, design, problem solving and overall STEM experiences offered. 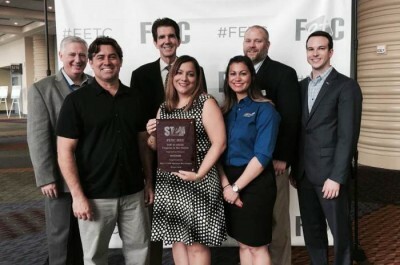 Winners were announced at the Florida Education Technology Conference in Orlando, the largest such conference in the eastern U.S. MAST@FIU was the only Florida school to be recognized. MAST@FIU is the Marine Academy of Science and Technology magnet high school located on FIU’s Biscayne Bay Campus (BBC). The academy leverages leading faculty from FIU’s School of Environment, Arts and Society (SEAS) to enrich students’ learning experience. Part of the highly successful partnership with Miami-Dade County Public Schools known as ACCESS, MAST@FIU supports state objectives to create more STEM graduates in Florida. The school opened in Fall 2013 with 100 students and a dedicated facility on the BBC campus is planned. To learn more about MAST@FIU, visit their website.